Every year in September, we sponsor a beach cleanup in Ocean Beach, in conjunction with the Ocean Conservancy's International Coastal Cleanup event. Dozens of volunteers, young and old, gather at the Cottage Walk Dune Overpass to collect and identify trash & debris along the beach. Snacks are provided and prizes are given out to the children. We typically gather and catalogue over 100 pounds of refuse. 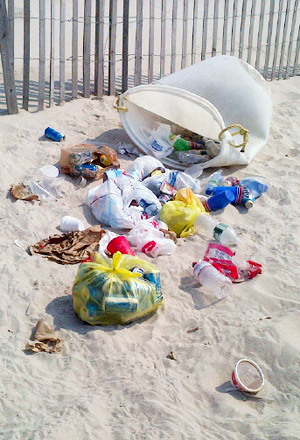 Be on the lookout for the next beach clean-up coming later this year! Where: At the Cottage Walk beach overpass. Bring: Gloves, hat and sunscreen. Water provided.